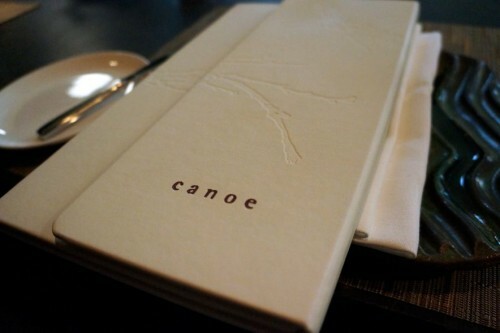 Known as one of the top fine dining restaurants in the city, Canoe has been serving up regional Canadian fare since 1995. Sitting on the 54th floor of the TD Bank Tower, not only is the food beautiful but the restaurant provides a stunning panoramic view of the city. Upon entering the restaurant, which is part of the Oliver and Bonacini family (@OliverBonacini), I was amazed at the gorgeous view and loved the clean and simple décor of the space. It’s a fairly large restaurant with a capacity for 140 seated diners as well as two private dining rooms with capacity for 24 and 40 seated. Mike and I came by on a Friday night to celebrate our anniversary and chose the best seat in the house – the Chef’s rail. I enjoyed watching the careful preparation of the dishes and the intricate plating of it all. Not only does it give you an appreciation for the enormous amount of work that goes into each dish but it gives you an appreciation for the servers too. It’s not an easy job – memorizing each and every component of the dish, the story to tell and serving the plates in the correct manner. As mentioned, regional Canadian cuisine is served here. 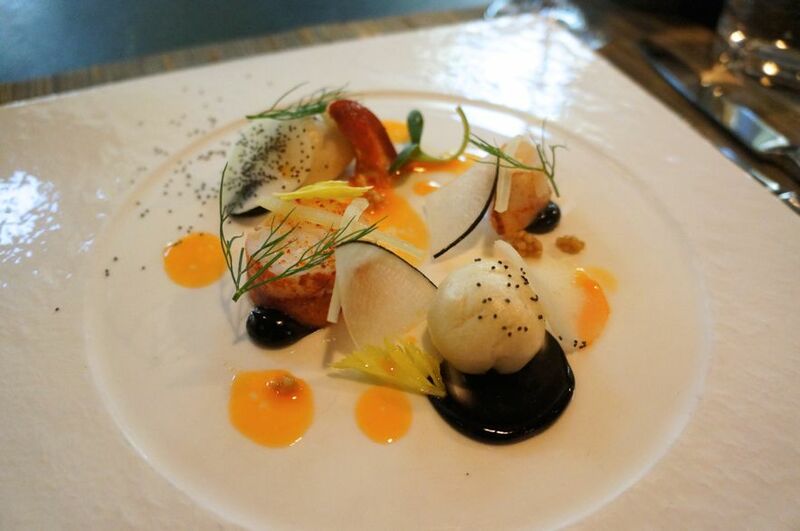 With refined flavours, there’s a significant emphasis on seasonal ingredients with the menus changing with the seasons. Without a doubt, Canoe is a special occasion kinda restaurant with most appetizers hovering around the $20-$25 range and entrees at the $40-$45 range. 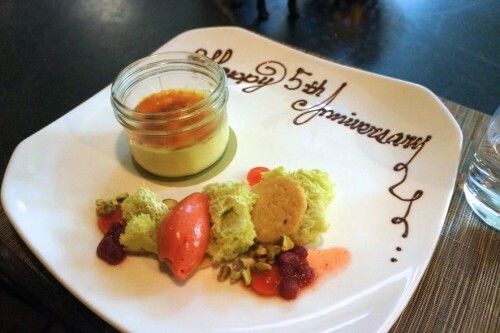 They offer a seasonal tasting menu at $100 per person or $150 with wine pairings. Their impressive wine selection (20+ pages) is certainly worth mentioning and I loved that they had a good selection of wines by the glass as well as half bottles. In the kitchen you’ll find Executive Chef John Horne (@ChefHorne) and Chef de Cuisine Coulson Armstrong (@Chef_Coulson). Chef Horne spent years working at Michelin star restaurants in Europe and seven years at Auberge du Pommier as the Senior Sous Chef perfecting his French culinary techniques. Chef Armstrong started out as Chef de Partie at Auberge du Pommier and was promoted to Sous Chef within two years. In 2013, he was promoted to Senior Sous Chef at Canoe where he’s now the Chef de Cuisine. Last year he was the recipient of the Top 30 under 30 honours by The Ontario Hostelry Institute. Rest assured, you’ll be in great hands! Mike and I decided to go with the seasonal tasting menu which started with the Yarmouth Lobster – Kohlrabi, poppy seed steamed bun & squid ink mayo. It was a nice light way to start off the meal. The lobster was perfectly cooked, I loved the squid ink mayo and enjoyed the addition of the adorable steamed bun. A lot of care goes into all the components, including the lobster oil which they make in-house. 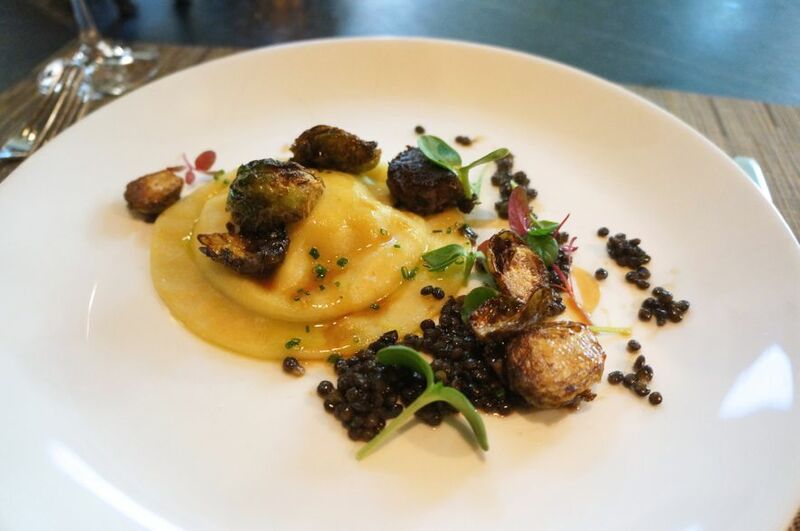 Up next was the Duck Egg Raviolo – braised lamb neck, beluga lentils, fried Brussels sprouts. Unlike the delicate first course, this was certainly heavier and more substantial. After cutting into the raviolo, the bright egg yolk poured out creating a wonderfully rich and creamy mouthful. The pasta was cooked to a nice al dente and the little bite of lamb neck added some protein to the dish. Oh, and fried Brussels sprouts are always a win in my books! 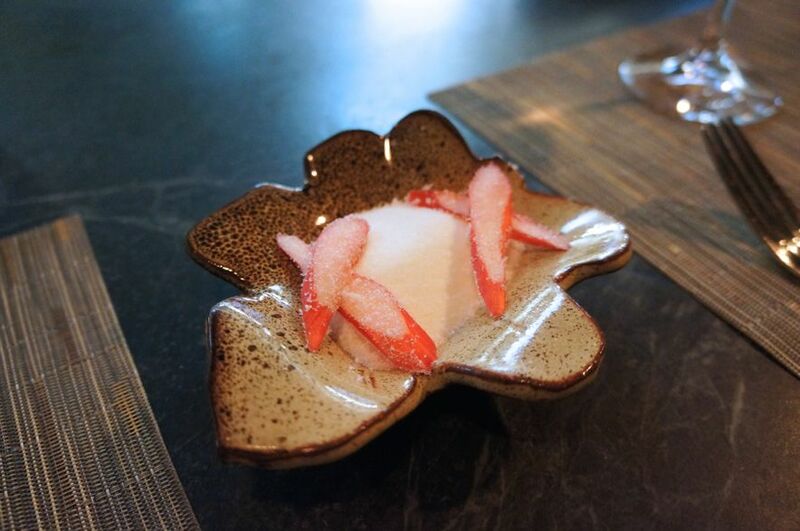 Before our entrees arrived, we were served fresh sliced pieces of rhubarb dipped in sugar as a palette cleanser. I wasn’t sure what to expect but I thought it was brilliant (and it very much necessary after the rich raviolo). 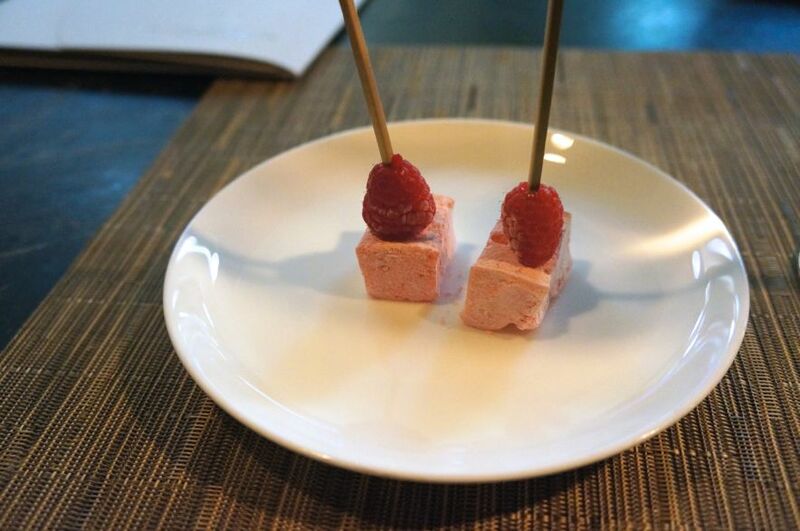 The tartness from the rhubarb and sweetness from the sugar worked wonderfully – like a refreshing sour patch candy. There were two options for the main course so we tried them both. 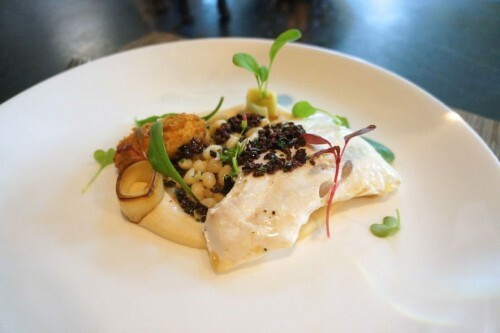 I went with the Cocoa Butter Halibut – charred leeks, Guelph navy beans, citrus parsley root puree & brandade fritter. Halibut is a pretty firm fish but this perfectly cooked piece of halibut had a tender mouth-feel. The hearty beans and wintery root puree were a great accompaniment which really completed the dish. 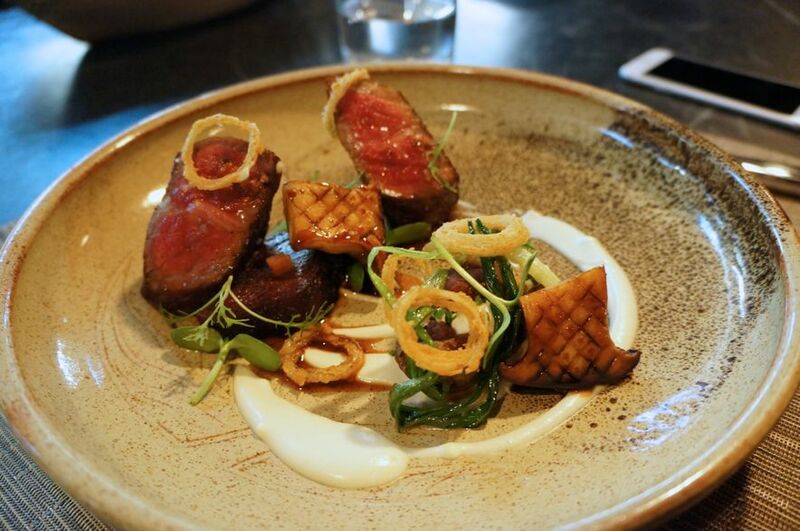 Mike went with the Wagyu Tri-Tip – smoked tongue, king oyster mushroom, cauliflower sour cream puree, bacon chive jus. Between the two mains, we both preferred the meat. The fatty pieces of wagyu just melted in our mouths as did the delicious bite of smoked tongue. We really enjoyed all the components of the dish including the meaty oyster mushrooms, the cauliflower sour cream puree and the stuffed blue potato was just the icing on the cake. The tasting menu ended with the Mason Jar Creme Brûlée – preserved wild strawberries, shortbread cookies. The brulee had a crisp top which had been torched the perfect amount and I loved that it wasn’t too sweet. The delicious strawberries and sorbet were a nice refreshing touch and overall, I thought this was a great way to end off the meal. In addition to the tasting menu, we were treated to the S’mores Foie Gras – graham cracker crumble, chocolate sauce & toasted marshmallow cream ($28) which is offered as an appetizer on the a la carte menu. In speaking with Chef Coulson, this is a new dish that they are clearly excited about. And for good reason! 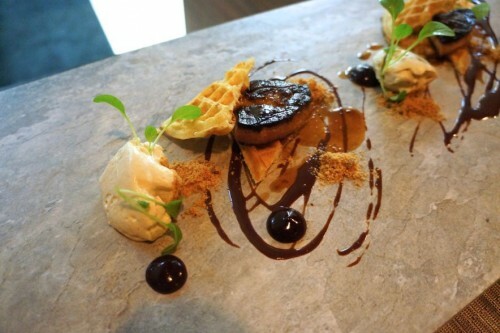 This was such a fun (and indulgent) take on the s’more – seared foie gras sitting on top of a waffle with a dusting of graham cracker crumble, chocolate sauce and marshmallow fluff. This sweet and savoury combination hit it out of the park! Needless to say, we had a fantastic experience at Canoe. Fine dining restaurants are a dying breed in the city but there’s a reason why Canoe has been going strong for twenty years. Beautiful dishes which tasted as great as they looked, top-notch service and a view that can’t be beat!